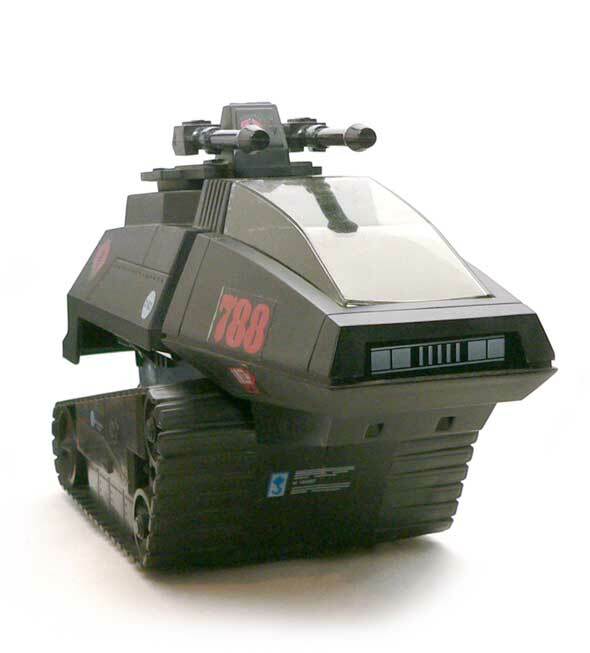 As one of the first Cobra vehicles, the H.I.S.S. tank has earned a spot in most GI Joe fans hearts. The iconic battlefield conveyance of “The Enemy” has remained relatively unchanged until it’s recent redesign. In theory, it’s name translates to HIgh Speed Sentry. 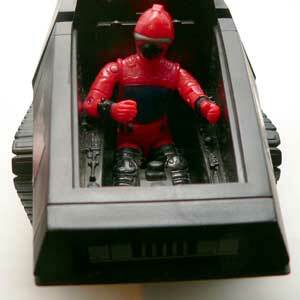 In reality, it was a stylized tank for Cobra to motor around in. 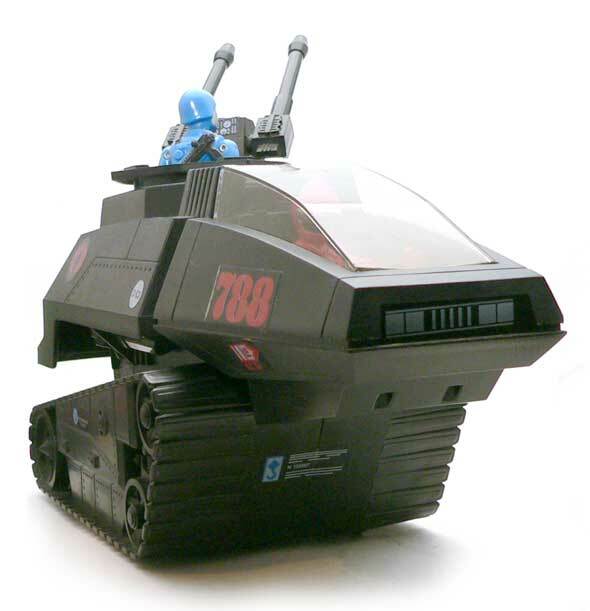 There were so few Cobra vehicles and armor, it’s a wonder they have been able to put up a good fight all these years. Here’s the thing that surprised me. The HISS is smaller than I remember it. When you think of tanks, you think of a large armored chunk of metal. This vehicle is around the same mass as the VAMP. Normally, you tend to think of tread vehicles as being rather massive. But the treads on this bad boy are shorter than a figure. Comparing the HISS to the Mobat, is like comparing a Corvette to a Hummer. The HISS is sleek in its design and looks very finished off. It even has a sloped tinted canopy. Under that canopy is a rather generic looking cockpit. The design looks more like something for a straight legged figure. The driver sits in a seat with his legs straight out and controls around him. There’s no real steering wheel. Must be like the the arcade version of Battlezone. 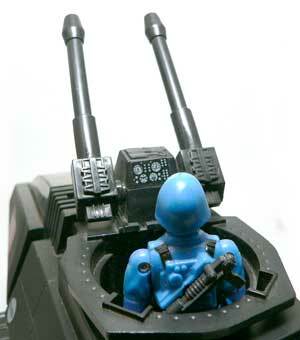 For armament, there’s a manned turret that takes up the bulk of the body. It looks a bit like a cup holder slid into the body. On the front are two connected guns that tilt up and down. This is where one of my few issues with this piece comes in. The guns. They look like high tech sort of laser cannon. I’m okay with that. What I don’t like is they are flat on the end. It just makes them look less gun like to me. With hand held weapons, I understand the need. But guns of this size should be a little hollow at the end in my opinion. One nifty detail is the “hitch” on the back. I don’t think there were any tow ready Cobra accessories at the time. It’s nice to see Hasbro thinking ahead. 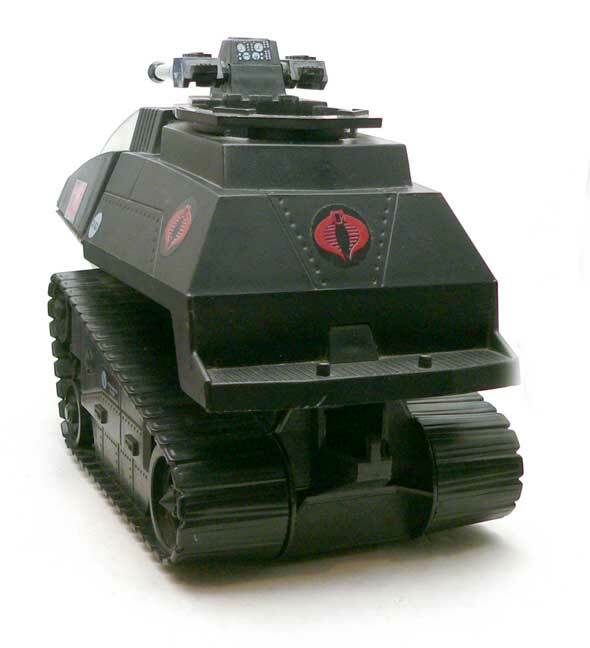 The stickers for the HISS are typical GI Joe stickers. These are printed on clear material and let the black show through. Most are the warning sign / ID stuff you find on military vehicles. There are a number of Cobra logos as well. There are not any decals for the cockpit, although there is one for a small control panel on the turret. The one disappointing decal is the front grill and headlights. While the recessed design is cool, sculpted elements would have been much nicer than a sticker. Very iconic vehicle for the line. I never really had one, as I preferred the less futuristic designs, but my cousin had it and it was a very nice piece.